Allen Kessler opens from middle position with a raise to 16,000 and action folds to the cutoff where Michael Hasserazad three-bets, making it 40,000. Action folds back to Kessler who tanks for a bit before moving all in for 158,000. Hasserazad thinks for a bit, then calls. Kessler is well in the lead and stays that way as the board runs out . With that, Kessler moves over 300,000 and Hasserazad drops to around 275,000. The money bubble is now broken and all players remaining are guaranteed at least $2,701. Action is heads up on a flop of between Calvin Anderson and Matthew Stahl. Anderson is first to act from the big blind and he leads out for 60,000. Stahl thinks for a bit, then calls. The turn is the and this time both players check. Anderson decides to lead out on the river and he bets 153,000. Stahl thinks it over for a bit then calls. Anderson shows his and with that he's able to take down the pot. Inayat Dossani opens with a raise to 20,000 in middle position and Lakisha Slaughter calls in the cutoff. The flop is and Dossani leads out with a bet of 20,000. Slaughter thinks for a bit, then calls. On the turn, Dossani slows down with a check and Slaughter puts out a bet of 33,000. Dosani doesn't take long and relases. There is right around 60,000 in the pot on the flop between Calvin Anderson and Matthew Lambrecht. The board is and Anderson, in the small blind, leads out with a bet of 31,000. Lambrecht goes into the tank and thinks for a bit before moving all in for 177,000. Anderson drops into the tank and thinks for a while before he calls. Anderson made the call with just ace high and needs to catch up in order to take down the pot, but the board comes then and Lambrecht's jacks hold up for him to take down the pot. Warren Sheaves moves all in from early position for 86,000 and action folds around to the small blind where Gary Simms calls in the small blind. Joseph Laro is in the big blind and he tanks a bit before folding his hand. The board runs out and both players have the same hand so they chop the pot. "I folded pocket nines," Joseph Laro says after the hand. "I'm the luckiest boy in the world!" Sheaves says in a high pitched voice. Action is now underway on Day 2 of the Harrah's Cherokee Main Event. With only 136 players left in the Harrah's Cherokee $1,700 Main Event it's two poker superstars headlining the action. On Day 1B, two-time World Series of Poker bracelet winner Calvin Anderson was able to bag up 959,000 chips, good enough for the overall chip lead in the event. 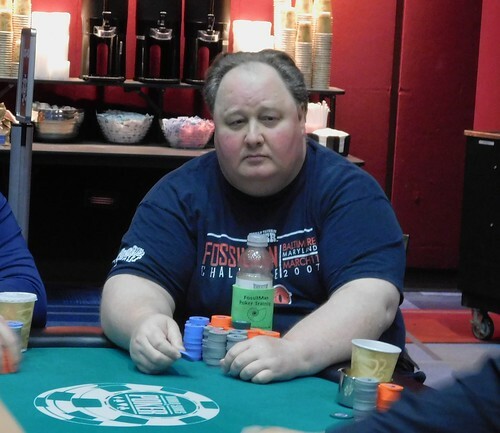 While on Day 1A, former World Series of Poker Main Event Champion Greg Raymer found a bag with 723,000 chips in it, good enough for third place overall. They return shortly on Sunday, April 21st where they will look to claw their way to the first place prize of $300,536. Players will start the action just 21 spots away from the money in level 18 with the plan being to play another 10, one-hour levels on Day 2. When the bubble busts, players will be guaranteed at least $2,701. Other notables returning to action on Day 2 include Allen Kessler, Jared Jaffee, Damjan Radanov, T.K. Miles, Tyler Patterson, Marshall White, Ryan Van Sanford, Krzysztof Stybaniewicz, Warren Sheaves and Ralph Massey just to name a few. Action is set to begin at 12 p.m. local time. Play will begin in level 18 with blinds at 3,000/6,000 and an ante of 1,000. You'll be able to find live updates from the event right here on WSOP.com so make sure to tune in.